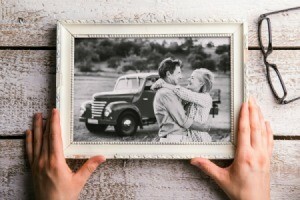 Give old picture frames a new lease on life by repainting and otherwise decorating them. This guide contains tips about repainting old picture frames. Renew and refurbish old picture frames, even rusty metal ones, with acrylic paint. Try mixing silver paint with different colors for unique results. For wooden frames, use Gesso to glue lace or lacy seam binding around the edges for a carved look before painting. Use one color and let it dry, and then top with another color, wiping off most of it for an antique look. You can even paint old mat board with acrylic paint. Experiment with different colors that work well with your picture/photo. You can spray with clear acrylic to give further protection, and add a shiny look.